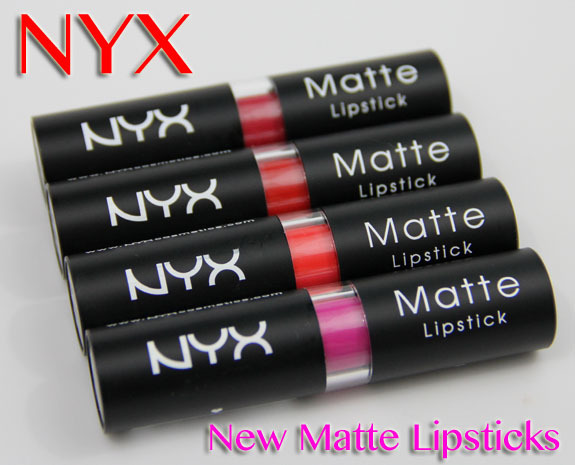 New from NYX are Matte Lipsticks which are super pigmented, matte finish lipsticks that come in twenty-two shades. 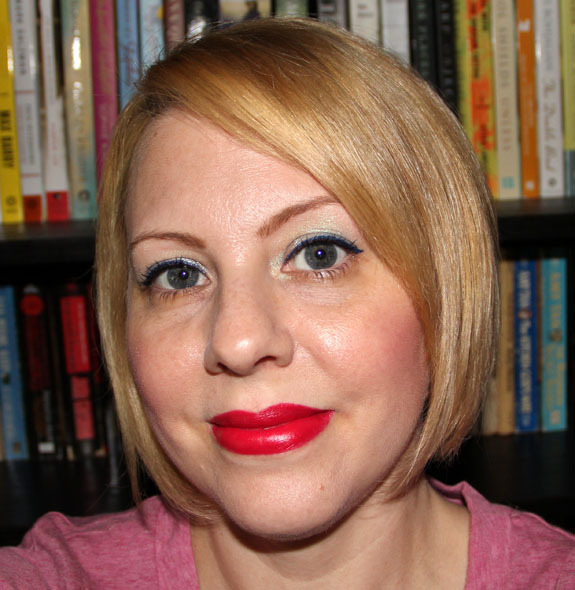 These are matte as far as the look and texture goes, but they actually feel a lot more moisturizing than you might expect from a matte lipstick. And coming from me, aka “Mrs. Dry Lips” that’s saying a lot! I really like the tubes these come in. They feel fairly durable, not super cheap or flimsy. But the best part is you can actually see through the middle of them at the color inside so it gives you a better idea of what it looks like. 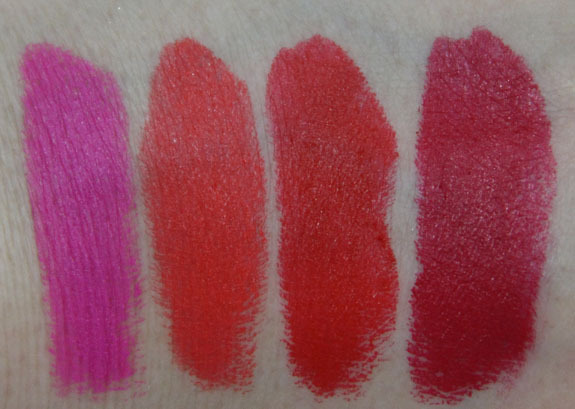 All the lipsticks are super pigmented and rich. The texture goes on creamy and easily and then kind of sets after a few minutes. They are matte in the sense that they don’t have a lot of shine, but they don’t look super matte like some lipsticks do. As mentioned above, they feel really moist, not tight or dry, and they last hours and hours with no bleeding, fading or drying out of my lips. I wore Indie Flick for 4+ hours with no primer or lip liner and it felt very comfortable the whole time and I had no issues. Great stuff! 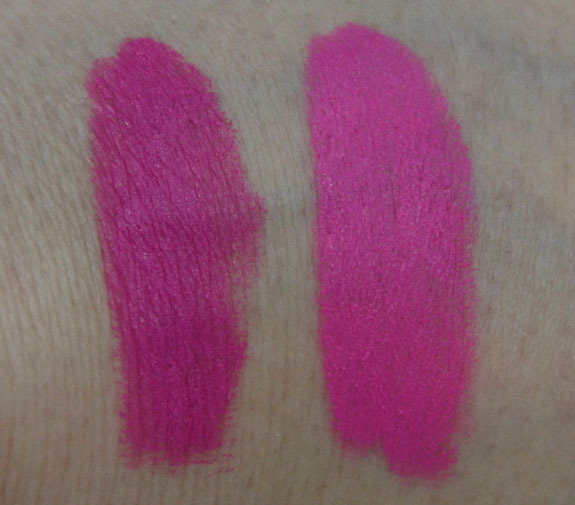 When I first applied Shocking Pink I thought it was going to be a dupe for MAC Candy Yum Yum. No such luck as you can see, but they are somewhat similar in that they are both super blue-based bright pink mattes. I really like these colors and the texture. 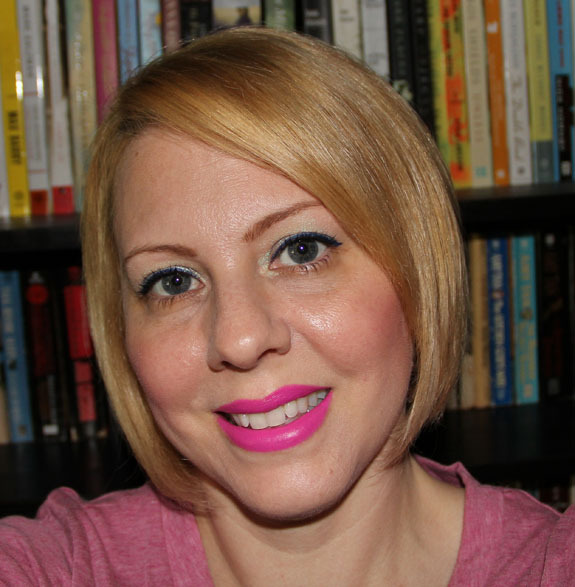 They feel great on my lips and I like that they have a wide variety of colors available. What do you think about these? Would you try them? Jesse’s Girl Pure Pigment Eye Dust Swatches, Photos and Review! Wow, I’ve never used NYX’s lip line. I saw them at ULTA and was always curious about them. Thanks for showing them! I adore Shocking Pink, it’s so vivid. Now I’m going to have to buy a few. love them all! but especially the pink one looks really hot! siboney2046´s last post…I love Gingers! I have to have these. Hopefully Bloody Mary works well on my tanned skin. I actually like the NYX better than the MAC Candy Yum Yum. 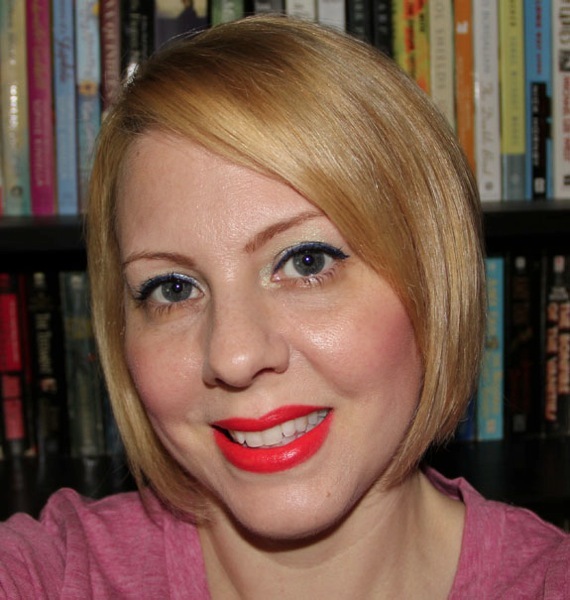 Amanda´s last post…October Julep Maven! 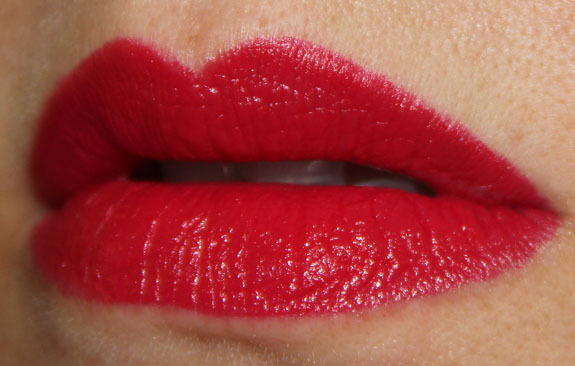 Even though I don’t wear bright lipsticks much, I drooled over MAC Candy Yum Yum but never got it. So, I was excited when I thought that maybe NYX had a dupe…but…oh well, no dice. every single one of them looks awesome on you! I like Pure Red on you the best. I would wear that one and Bloody Mary too. The others just wouldn’t go well with my skin tone. However, your reviews, as always, are thoroughly enjoyed. They all look great on you. I can’t wait to try those “reds”. The colors are really great and look great on you. I like how they dont look super matte! I am always scared away from matte thinking they would be so so dry! This is good to know! I’m going to try this one out, I like NYX’s stuff. I love there Lip Creme’s from last season. They sell it at a beauty supply near me, but it always takes a while for the new stuff to get in. Where do you typically buy your’s from Kelly? I rarely see NYX in stores around here actually! I have gotten them from Cherry Culture online though. I’m loving Indie Flick, I know it’s “so last summer” but I’m just getting into coral colors. It is so gorgeous! Those colors are so bold.. I can’t pull off most of those lipsticks lol. Each and every one of these looks GREAT on you. I was SO happy to see that these are not a chalky matte. They look really hydrating without being glossy, and what more could you want for $6 a pop? I’d like to add my vote to the bookcase background love, too! They look great! Do they have a scent? Not that I noticed. No taste either! dark colors look so awesome on you..! I love Indie Flick! But they aren’t really matte at all, it seems, they look so creamy and shiny! I love NYX round lipsticks, so hopefully I love these too. 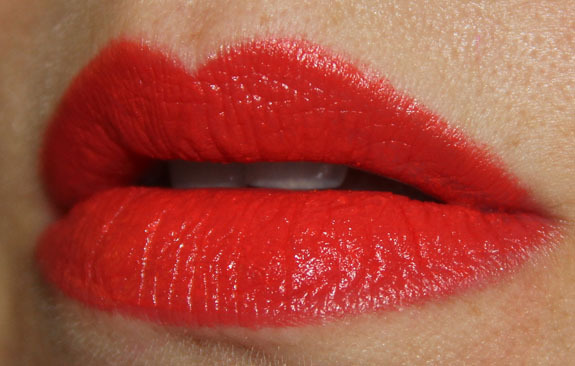 I want to buy Bloody Mary after I saw your swatches! Love Bloody Mary! 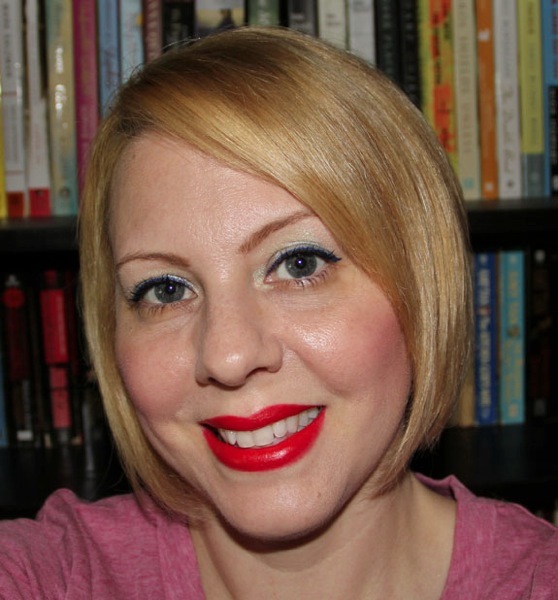 I just got my very first NYX matte lipstick (from the Hautelook sale) in a vampy red, can’t wait to try it–good to hear how it wears and feels! ManicuredSlayer´s last post…Slayer Savings: HSN: Deborah Lippmann Footloose polishes! Those shades look so pretty on you but I am not brave enough to wear any of them. These look really nice. I like that they’re not the super flat looking finish you’d think of. Lovely shades that all look fantastic on you. Thanks again for your great photography. Makes things very easy to want! They look amazing on you! I think I like Indie Flick the best! I love the NYX matte lipsticks so much! 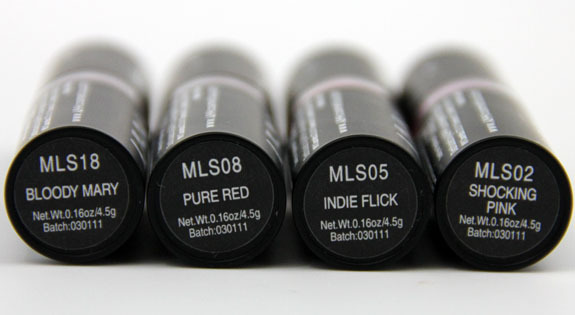 I’ve got Indie Flick and Pure Red, but I’m adding Shocking Pink to my wishlist! Those look really nice! For some reason when I think of matte lipstick I always think of it being really dry and patchy. Past bad experiences, I guess. 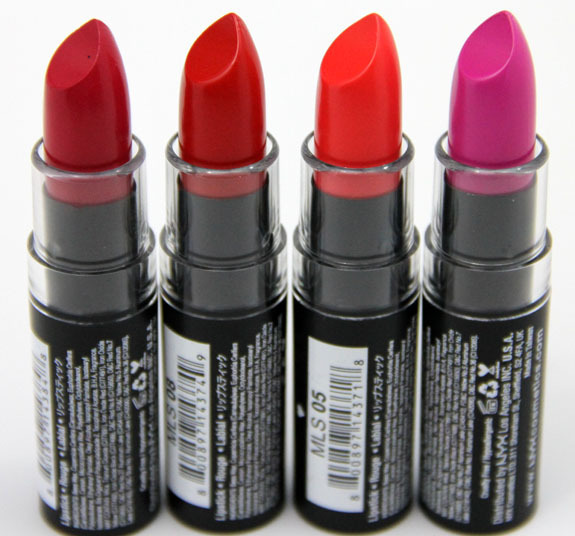 I like the regular NYX lipsticks so I might have to get some of these.